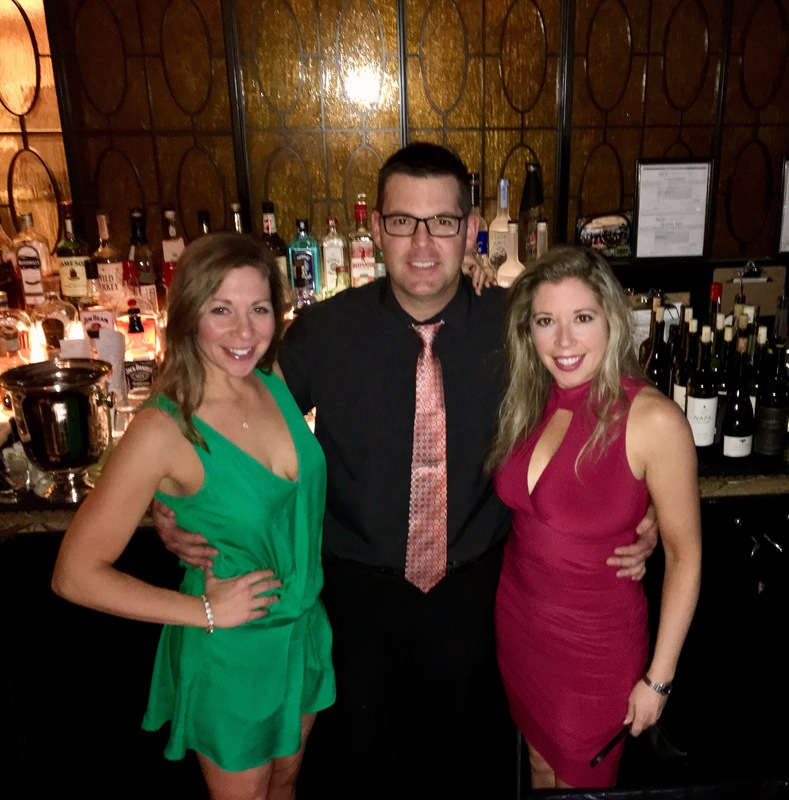 Vegas 2017: Part One – Eat, Drink, and Go! I realized this is going to need to be broken into at least two parts, as my usual 30-minute writing block was no where near sufficient to cover a Vegas weekend. Sorry I’ve been out a little, I was getting ready for and then busy doing Vegas. I’ve done Vegas many times and in many ways. Doing it up, doing it casual, it’s truly a different experience every time. I think I just logged my thirteenth visit. I’ve stayed at many different hotels on the Strip. There is something for everyone and in every price range (let me know if you need recommendations!). After all these years, I’ve closed in on my favorites and bounce between them. Super Bowl weekend is definitely a fun time to be out there. But other times hold other adventures just as great! Pools in the summer, Grand Canyon day trips in the fall. 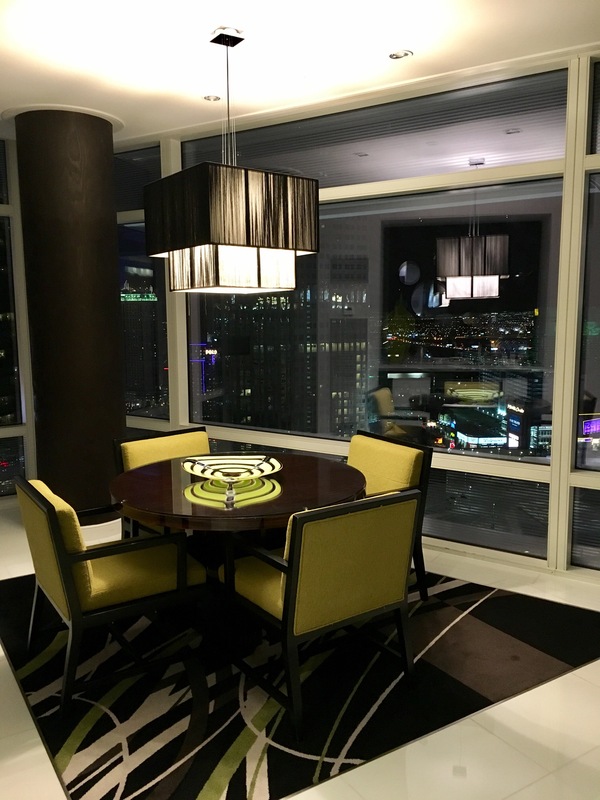 This year for Super Bowl weekend, we got a great suite at the Aria (see http://www.eatdrinkandgo.com. This is one of the “where to stay” spots). One bedroom corner suite, panoramic view. Waking up to the view of the mountains was great! And everything in the room is automated and controlled on an iPad-like thing. The bathroom has excellent lighting, which is a must for girls’ nights. Yes, that’s me above, all done up for the evening. I wear high heels approximately 1-3 times a year. And almost exclusively in Vegas. 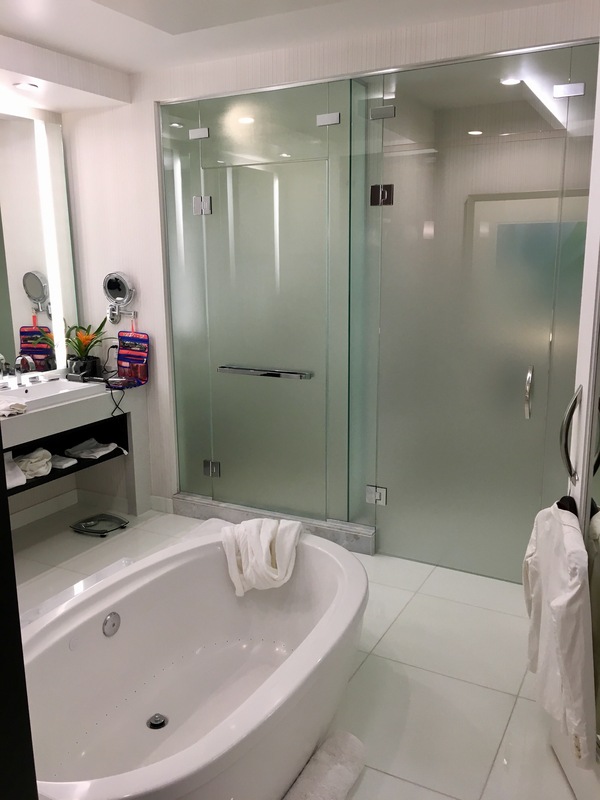 The tub in the middle is cool, but I don’t think we’ve ever used it! Did I mention how good the lighting is? How do you get no-cellulite lighting?!? Anyways, I really enjoy these suites – and they come with limo transportation to and from the airport, so that’s awesome. 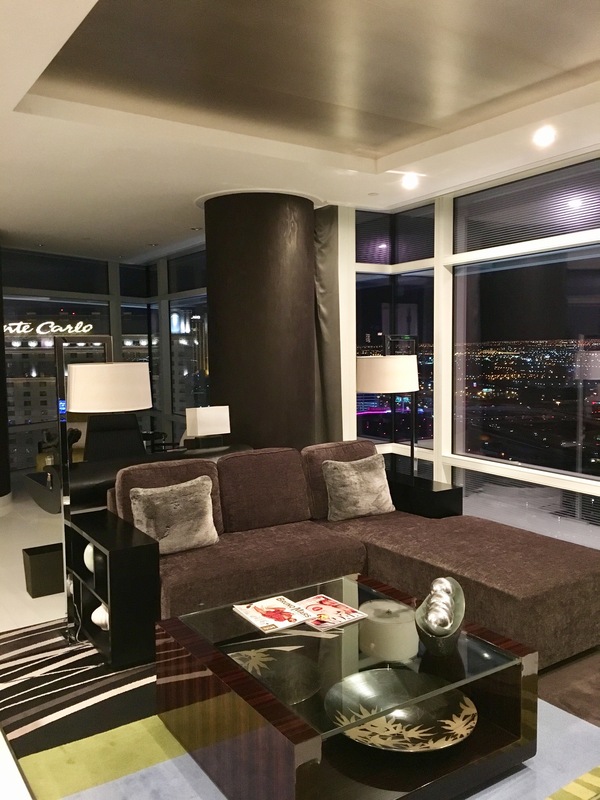 Between Aria and Cosmopolitan, it’s tough to decide which is my favorite place to stay. I think Cosmo has the edge for location and balconies, but Aria’s rooms are so comfy! 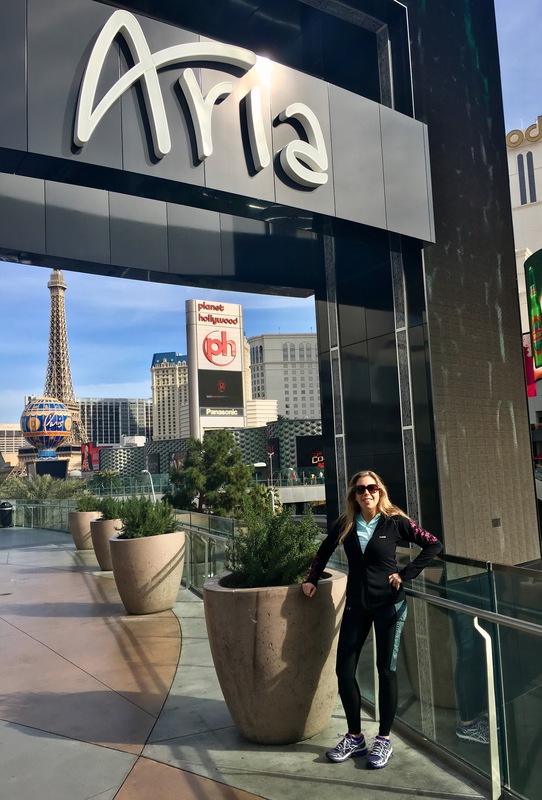 One year I spent a whole day in the bed at the Aria, but that’s a story for a different blog. I could probably write a whole blog about Vegas. 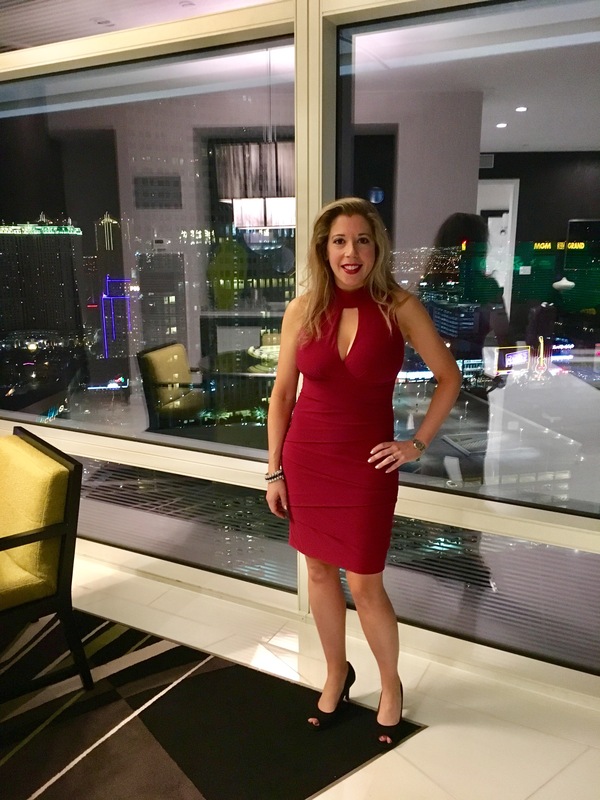 The first night, we did it up in dresses and heels, full hair and make up, and made our way to our favorite spot we always hit first in Vegas – Olives in the Bellagio for dirty martinis and a view of the fountains! The fountains never get old for me. I could watch them all day and night. The food is also really good at Olives. Fresh bread comes out with olive tapanades and whole olives to get you started and the menu is a nice variety of contemporary Italian dishes. 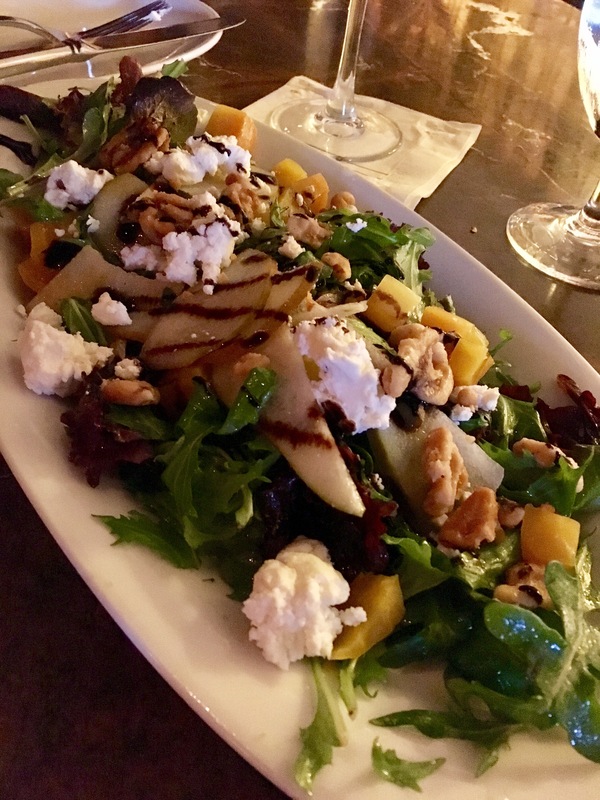 We ordered a beet, goat cheese, and pear salad and a fig, Gorgonzola, and prosciutto flatbread. 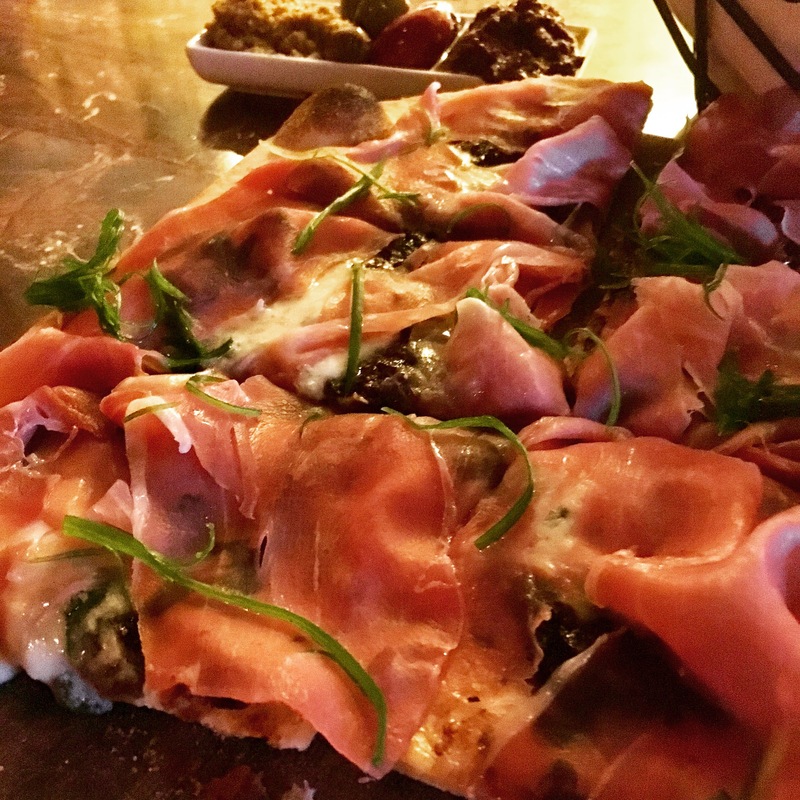 The prosciutto on here was delicious and plentiful – look at those heaps of meat! I wouldn’t have put the spring onions on top, so I gently removed them. 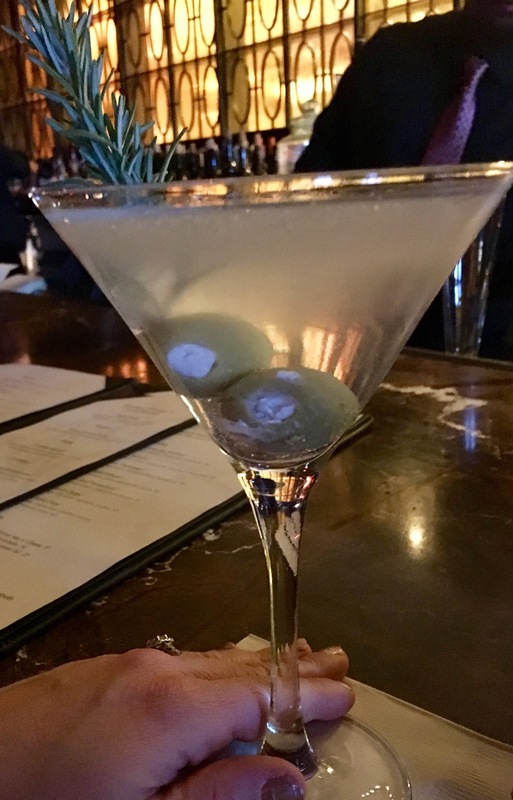 We have had the same great bartender at Olives, Chris, for the last I-don’t-know-how-many years. If you go on a Saturday night, he’s probably there serving up great drinks and great chats!! He even let us slip behind the bar for a quick pic. VIP treatment right there!! Chris is obviously the one in the middle (my “ride or die” girl is in green on the left). We went on to mosey about the Bellagio, lose a few bucks on the roulette table, then back toward our hotel to hang local for the first night. 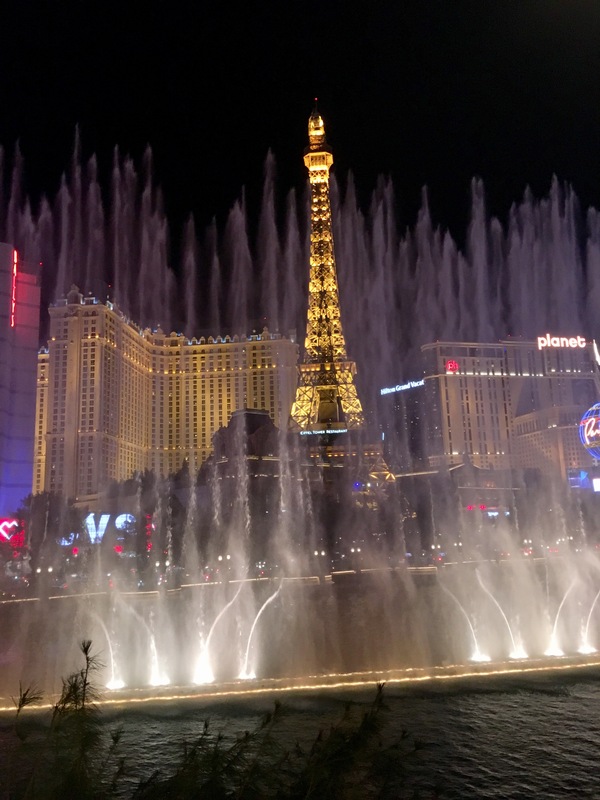 You never know where the night will take you in Vegas. I’m sure that’s the first time anyone has ever said that about Vegas. But honestly, I think our best times have been entirely spontaneous. Alibi lounge in Aria was a nice stop for an after dinner champagne (which we later learned is free for ladies on Monday nights, see next Part in this series) and then over to the club – Jewel – for some dancing. The music that night wasn’t really my style, but it was still fun and swanky. And who can be mad at a club with Veuve Cliquot magnums among the bottle service with hot chicks constantly pouring it? Saturday night, check!! 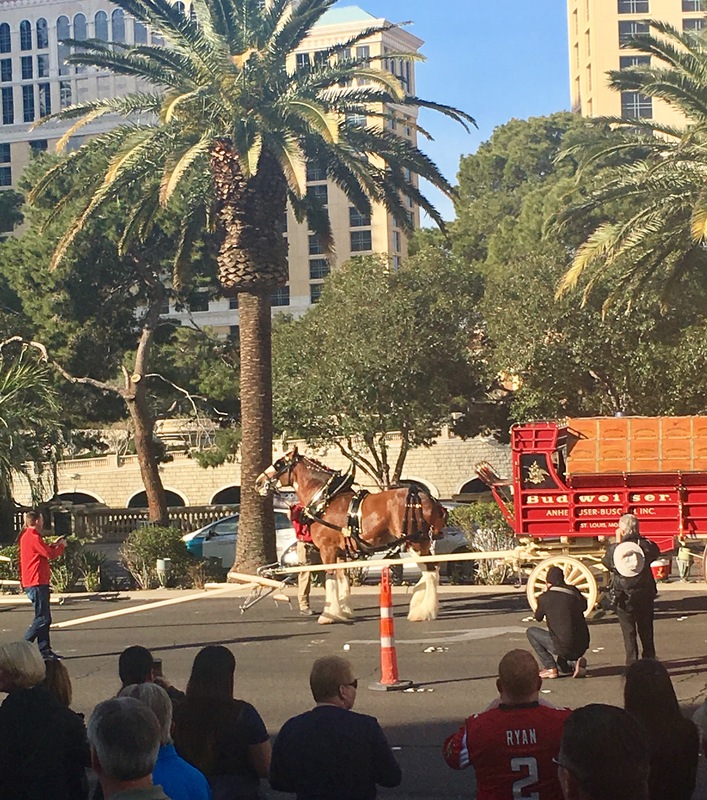 Super Bowl Sunday was next on our list, but not before brunch at our favorite spot for such on the strip – Mon Ami Gabi at Paris. Skip the buffet for a day and come here for a nice light French breakfast. 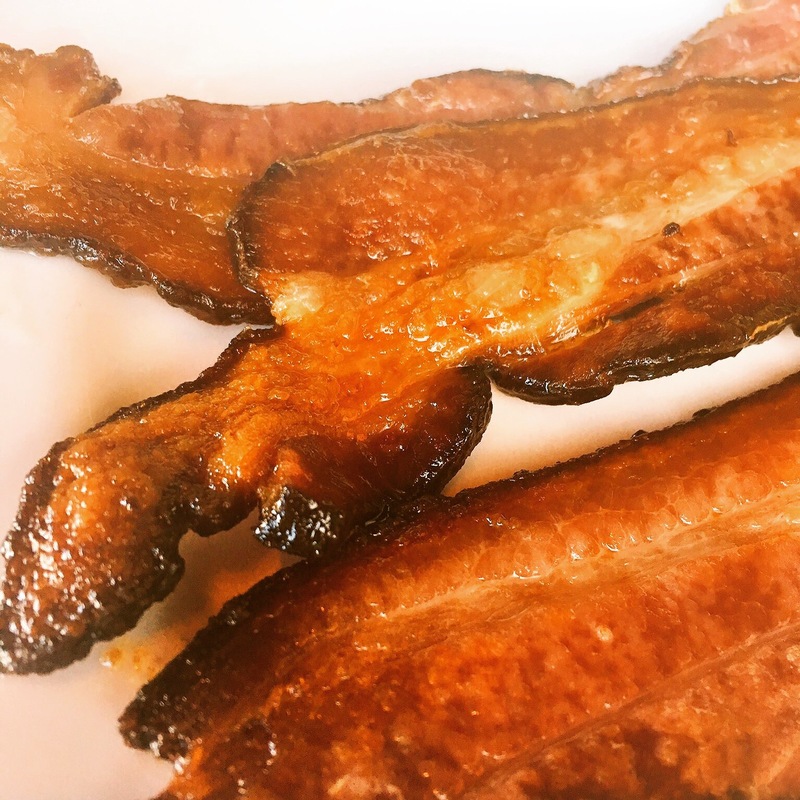 The date-glazed bacon was awesome!! If you’re into Bloody Mary’s, this is the place for them. And the coffee here is so good!!! I always drink copious amounts while we sit through a nice leisurely breakfast and gaze at the strip. The bathrooms are out the restaurant to the left just past the sports book. Hehe. 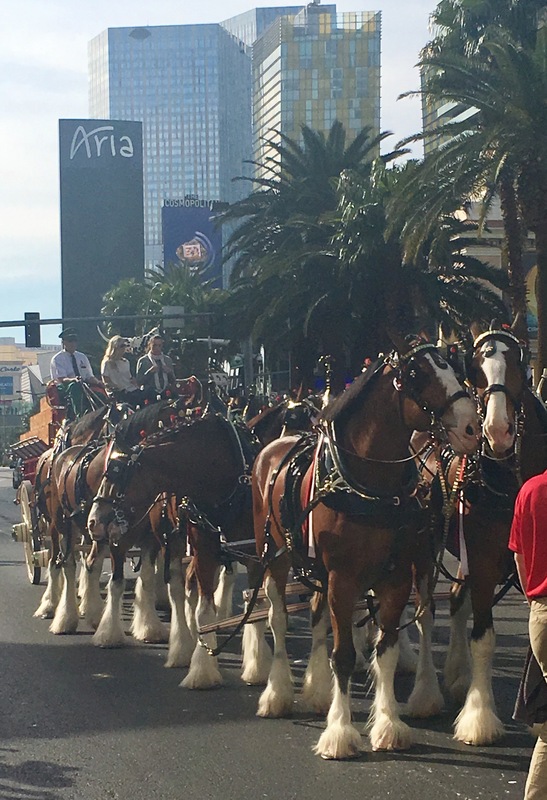 This time, we had a real treat for our Strip view – the Budweiser Clydesdales were getting suited up for a little trot!! So cool and so adorable!!! On to placing Super Bowl bets and deciding where to watch the game. If you can eat and drink $200 worth of goods, I would probably suggest one of the parties at any number of hot spots here, but that’s not quite our thing. We usually cozy up to a cool bar with a nice view of a tv and chill. Last year, Burger Bar at Mandalay by Hubert Keller was a great spot for game day and AMAZING burgers. The bison burger there is my favorite. There’s just not enough time to make it to all the great food spots out here. I highly recommend making time for Burger Bar if burgers are your thing. Not only are the burgers great, but the fries are awesome and there’s a good variety of styles (I like the skinny ones!! God I love fries!). The beer menu is pretty great there as well. This year, we hunkered down at a bar right across from a pizza spot in New York, New York. Beer and pizza, game time!! What was so cool – and a huge surprise – at this random bar was to find Alaskan Brewery beer on draft!! I don’t think I’ve ever seen this stuff outside of Alaska. Throw back to my Alaska trip posts from last summer!! Their smoked porter is so yummy!! Man that was a great trip…Alaska. Ok, back to Vegas…still jet lagged! Great pictures Go Girl! I love that you do the Super Bowl Vegas thing. How was the Aria compared to other places you’ve stayed, I wonder. The date glazed bacon sounds inspirational!! What a globe trotter you are – from Vegas desert to Alaska mountains, tundras to left coast Napa. I love your blog!